Asbestos Ceiling Removal - Is it Worth Doing the Work Yourself? Asbestos is extremely dangerous to human health when the fibers become airborne. Manufacturers of building supplies originally used it in building materials because of its insulating, heat-resistant and fire-retarding properties. 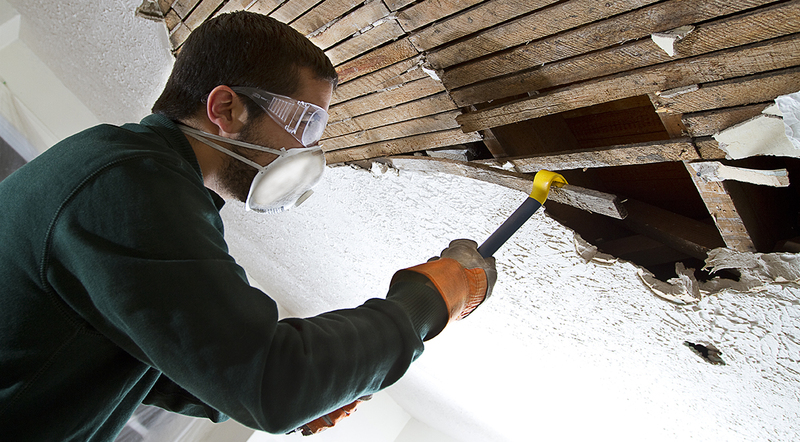 In older homes, you may find asbestos in “popcorn” ceilings. And while asbestos ceiling removal may be legal in your community, the U.S. Environmental Protection Agency (EPA) recommends that you hire a trained and accredited professional to handle the removal or remodeling of popcorn ceilings in your home or office. It's important to keep in mind that symptoms associated with asbestos-related diseases may take several years to develop. As you consider asbestos ceiling removal, be sure to learn the applicable laws in your state, county and city. In some areas, your only legal option may be to hire a certified asbestos abatement contractor. Other areas may allow you or a certified contractor to do the work. Some contractors may suggest applying a thin coat of latex paint with an airless sprayer to contain the asbestos. This option, however, may make it more difficult to remove the ceiling safely in the future. Keep in mind that painting over an acoustic ceiling that contains asbestos is illegal because the process will release the harmful fibers instead of encapsulate them. It is never recommended to try and handle the removal of a ceiling with asbestos. The do-it-yourself route is highly risky if you are not trained and certified in the proper containment and removal of this deadly material. It's always worth it to hire a certified contractor to do the job. A safe asbestos ceiling removal requires three adults: two of the people to perform the work, and a third person to act as an assistant outside of the work area who is able to fetch tools, water and other supplies. The people designated as the workers must be in good physical condition because breathing through a respirator places stress on the lungs and heart. Protective clothing can also become hot and feel uncomfortable in the humid conditions. People with beards may not be able to assist with the ceiling removal if the respirators don't fit them properly and interfere with the respirator’s seals. Your asbestos contractor will prepare the work area with poly sheeting to protect the walls and floor, including plastic sheets to make isolation walls along doorways and room openings. Similarly, the poly sheeting will be used to create a containment area outside of the work area where workers can remove their safety gear. When the project is completed, the plastic sheets in the work area will be sprayed with water to contain asbestos debris. Then, the sheeting will be carefully removed by rolling it up and placing it into asbestos waste bags with the appropriate labels and tagging. In the containment area outside the work area, the walls and floor will be sprayed with water, as well as the protective gear worn by workers in order to trap the asbestos fibers. The protective clothing will be removed while in this area and with disposable items thrown away, along with any rags that were used to clean the gear and equipment. Asbestos may only be disposed of at a landfill that has been approved by the Division of Air Quality. Attempting to remove asbestos from your home by yourself involves major risks and is not advised. It is important to remember that there is no safe level of asbestos exposure.Releasing asbestos fibers into the air during remodel and repair projects is virtually unavoidable and therefore it is always advisable to hire a licensed and certified asbestos abatement company to handle the job.